The all-new Daydream Island will welcome guests once again from 10 April, 2019. Bookings at the completely redeveloped and revitalised Daydream Island in the Whitsundays are now open for stays from 10 April 2019 and onwards as the resort kicks back into gear. Having been completely flattened by Tropical Cyclone Debbie in late March 2017, more than $100 million has been spent by its owners China Capital Investment Group on a total regeneration of the property, literally from the ground up. The new opening date is a slight pushback from the previous estimate of late 2018. From April next year, Daydream Island will reopen its doors to guests, offering an entirely new hotel and resort experience along with multiple new dining concepts. 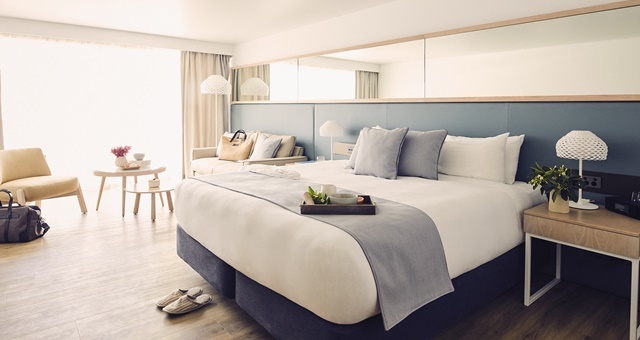 Aside from the resort itself, the property has also undergone a soft enhancement in the form of its logo and brand identity – a task carried out in conjunction with global brand agency Interbrand. The new marque draws on the island’s history and people, juxtaposed with its vision for the future. Daydream Island’s iconic mermaids – tragically washed away in the cyclone – and Living Reef resident stingrays both feature prominently on the new logo. Dining options at the new island consist of three restaurants and three bars under the keen watch and design of head chef Bradley Martin and head of F&B Adrian Tyler. The modern buffet ‘Graze’, Japanese outlet ‘Infinity’ and modern Australian offering ‘Inkstone Bar & Grill’ along with bars ‘Tonic’, ‘Silica’ and ‘Barefoot Bar’ are all tipped to be popular. An additional bar with innovative burger concept overlooking the Great Barrier Reef will also be located poolside. Daydream Island Director of Sales & Marketing, Jayson Heron, said the team on the island were working feverishly to get ready for guests next April. “The Island has undergone a huge journey from the devastation caused in 2017 by Cyclone Debbie and we wanted the new brand to signal the evolution of the Island.